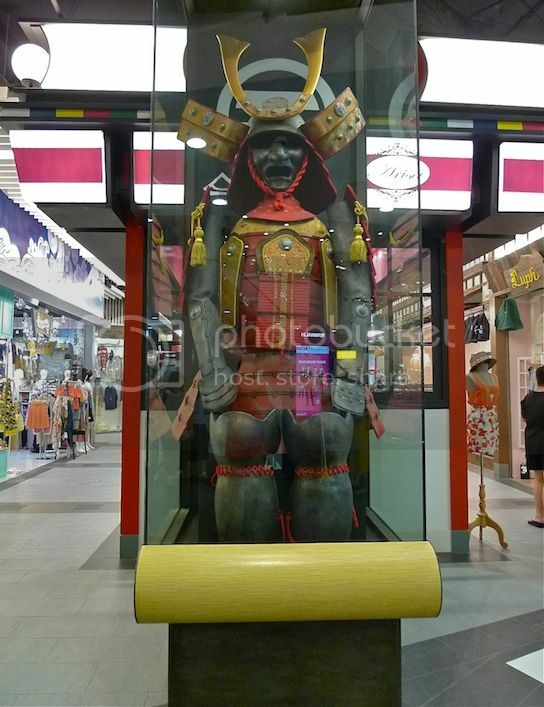 My Very First Blog: Meet The Sumo Wrestlers In Terminal 21 Bangkok! After visiting the amazing toilets on all 9 floors of Terminal 21, my friend and I explored the rest of this awesome shopping mall in Bangkok. The unique thing about this airport-like Terminal 21 is that each floor represents a famous city or place. We were on the first floor, which is the Tokyo-themed floor. 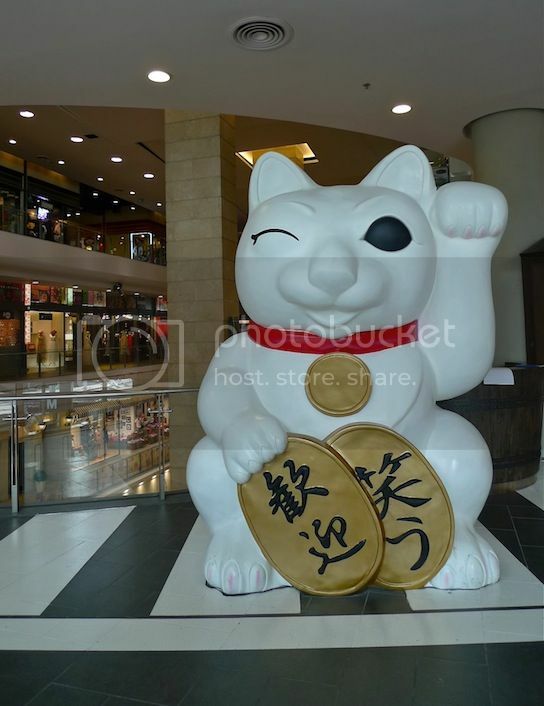 As we came up this floor from the escalator, a giant Maneki Neko greeted us! Maneki Neko, also known as the 'Beckoning Cat' is a common sculpture found in Japan. The Chinese also have their own version, usually referred to as the 'feng shui prosperity cat'. The cat had its left paw raised as if to beckon and welcome us to shop till we drop! In fact, it is believed that the raised left paw has the power to bring in lots of customers! No wonder they put this giant cat there! Now is that why it was winking at us? LOL! One of the iconic Japan landmarks I saw here was the Torii. 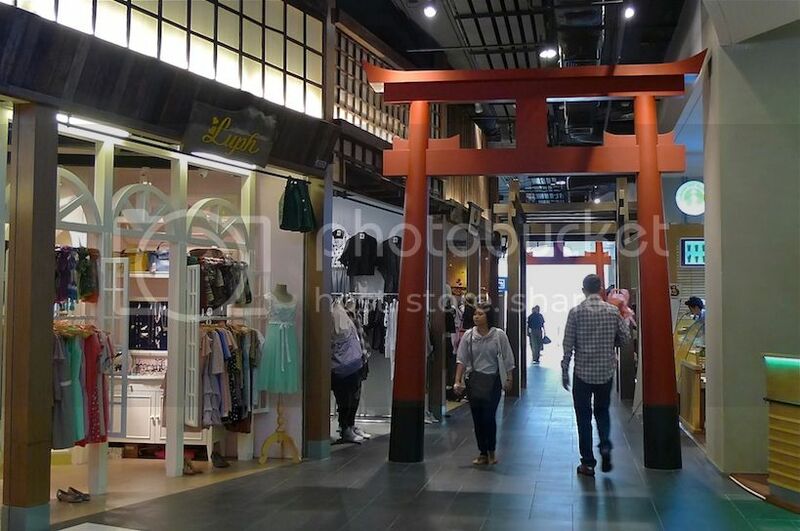 This Japanese arch painted in red, stood majestically between two rows of shops. I love it! You can find this ubiquitous structure in front or near Shinto shrines all over Japan. They are supposed to mark the entrances to sacred places. But I guess the Torii gate here does not signify anything of that sort - I did not find any shrines nearby haha! And then, not far away from the Torii, I saw this! What is this? Can anyone please enlighten me? All I know was that it looked pretty cool! While the second floor of Terminal 21 (London-themed floor) is dedicated to mens wear, this first floor is more for the ladies. 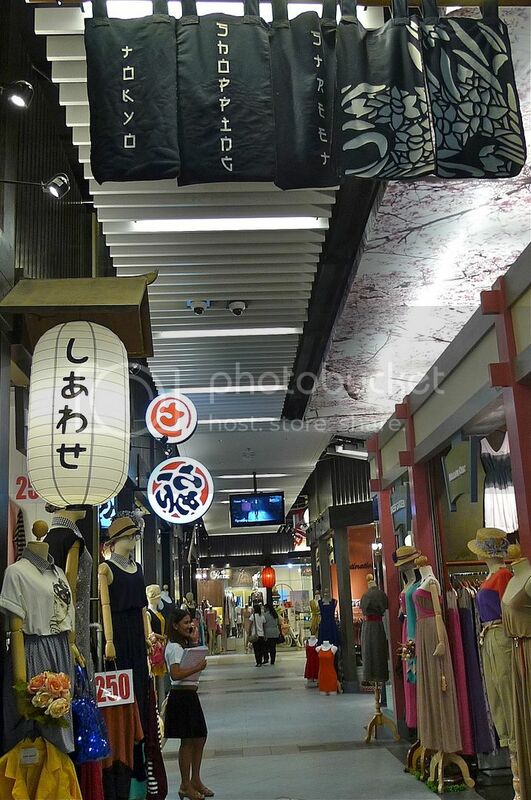 There are lots of boutiques here selling trendy clothes and accessories, such as bags and shoes, and some are most probably from Japan. 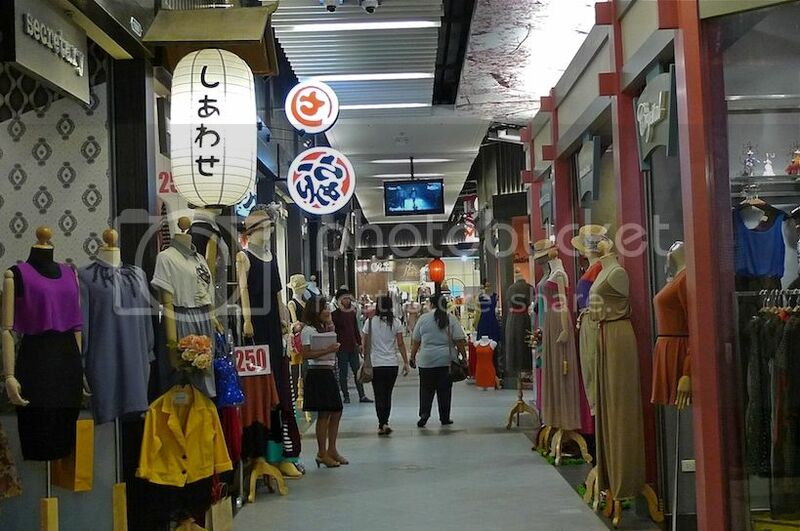 Apart from boutiques, there are also beauty salons and a handful of food and beverage outlets. OK, I did not take many pictures so I shall more or less repeat the above photo. Haha! Funnily, they were both stuck to, or should I say separated by the pillar! LOL! 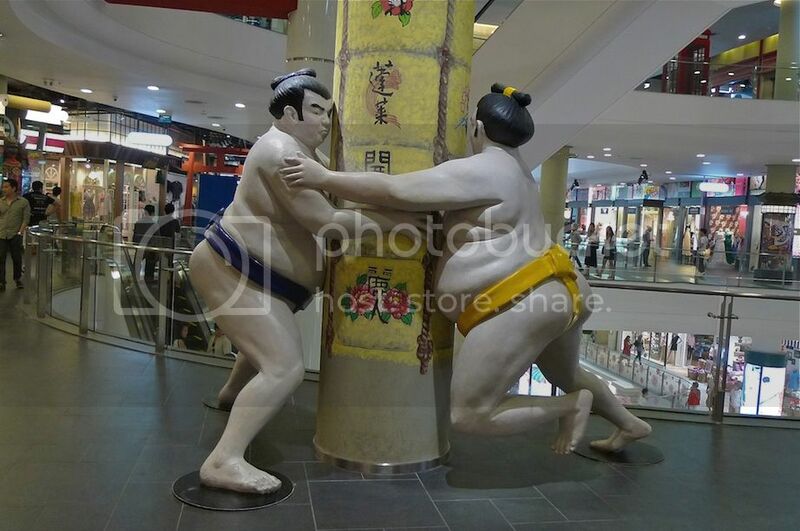 Only in Japan is sumo wrestling being practiced professionally. 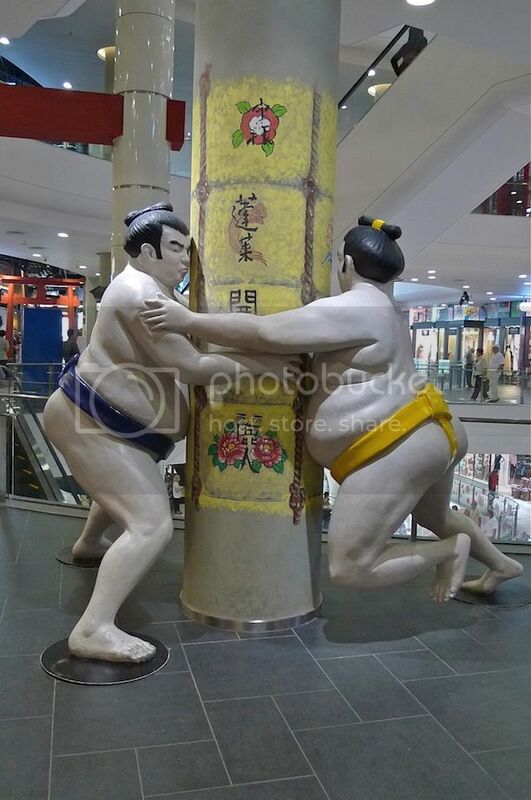 So I think it is apt that Terminal 21 put these wrestlers on display!